You have to appreciate a recipe that is equally easy as it is delicious! 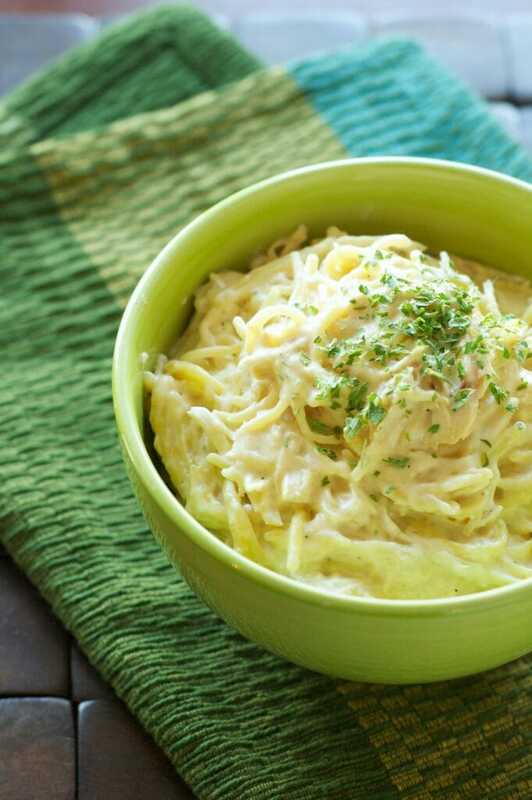 Enjoy this Slow Cooker Chicken Spaghetti today! 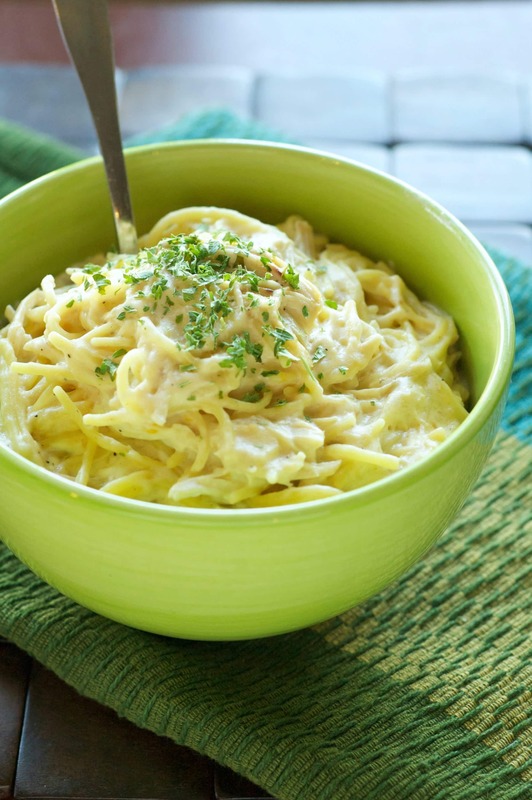 A bowl full of pasta and cheesy goodness sounds like the perfect end to a busy day!
. So I put my regular old slow cooker to the test and recruited my recipe tasters…umm, I mean my family… to try out the newest version! And it was just as creamy and tasty and best of all, just about as easy to make as the first! I had a super busy Sunday and needed to make something that wouldn’t need much of my time. I was invited to church with a great friend and only had an hour after I got home to eat lunch, change clothes, and leave to go and meet my friends for our training run. I threw the first set of ingredients in the crock for dinner and was out the door on time! By the time I got home I was completely exhausted! Good thing dinner was already mostly done! You add the pasta and the cheeses at the end for about 30-60 minutes. I was able to add those while I cleaned up the kitchen and played with my daughter for a few minutes. I also washed up and chopped some lettuce for a salad to go with our pasta! This dish was met with the approval from everyone in the family, even the two year old. And let me tell you, she has been super picky lately. I was doing a little happy dance that she actually ate dinner with no coercing or convincing required! 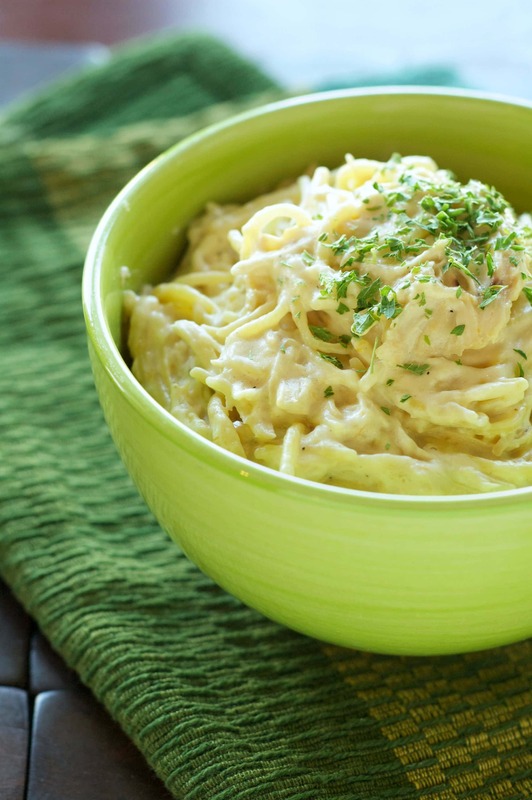 Did I mention just how easy this Slow Cooker Chicken Spaghetti is? Only a short list of ingredients is needed to make this meal, many of which you probably have on hand. Since you add the pasta at the end, this recipe is great to put in the slow cooker while you are away all day! It does the heavy lifting for you! 1 pound boneless skinless chicken breasts I used one really big one! I stirred this a couple of times after I added the noodles to make sure they were all cooked evenly. It took my crock exactly 45 minutes. Yours will depend on how hot it cooks and how long you leave the lid off. YUM! I’m thinking of trying the recipe with canned chicken. So I would essentially be starting at step 4. So the question is, how much broth should I put in the crockpot along with the canned chicken, spaghetti, etc.? Just the 3 Cups? It’s hard to say for sure without testing it out, but that sounds about right! Let me know how it turns out! Be sure to let me know how it turned out! I’m super curious as I’ve never tried this! Hi Becky! Are you looking to sub out the cheese or just use another along with it? Hi , trying this recipe tonight. What works for better taste and consistency. Cooking it on high 4 hours or the 8 on low.? Thank you! Hi Shelley! Either way should come out the same! I am very excited to try this recipe! I have IBS & Diverticulitis & tomatoes really play havoc on my stomach so I haven’t had spaghetti much in recent years. I’ve been looking for a good cream sauce recipe so I could eat it again & I think this may be it! I really like your site. 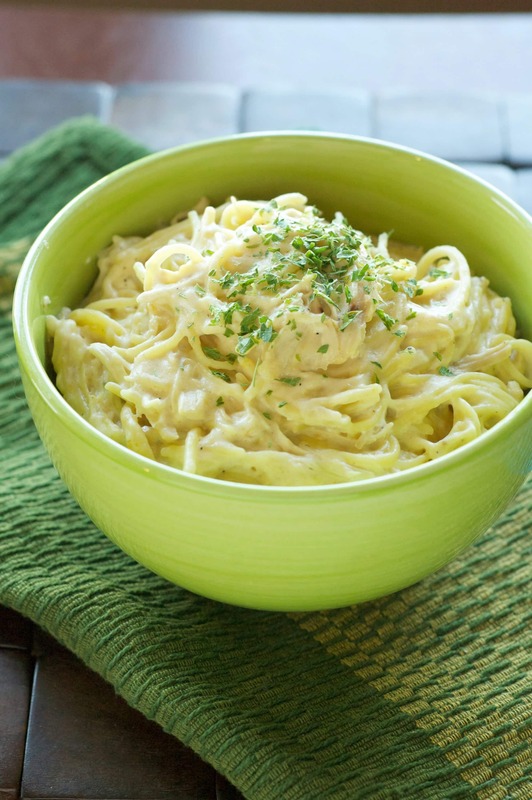 I have found several cream sauce recipes to try. Thanks a million! How many people will this feed, or how many servings will this make? Hi Sharon! A “normal” pasta serving is 2 oz and this uses 16 so theoretically this would serve 8. However, many eat more so I’d say 6-8 would be a good range. 1. You said to use 16 ounces of spaghetti. The boxes I had came in 12 and 13.25 ounces. I added up five of them, which came to 65 ounces. Since quadrupling the recipe would call for 64 ounces of noodles, perhaps the extra ounce I threw in absorbed the extra liquid. 2. The lid on my roaster oven doesn’t seal to the pan as tightly as the lid to my slow cooker seals to the crock. I wonder if, for that reason, the moisture inside the roaster oven escaped in a way it wouldn’t have in a traditional slow cooker. Thank you again for sharing this wonderful recipe! Hi Sharon!! Thanks so much for trying the recipe and for all the feedback! Yes, I agree and I think #2 would be the biggest reason. Slow cookers tend to collect a lot of condensation and the roaster may have let more of that escape. The other thing to consider is that the roaster may cook just slightly warmer, therefore you might just need to reduce to cooking time a bit. Do you think I could substitute cream of chicken or mushroom soup for the cream cheese? Hi Joyce! In this recipe I don’t think that would work, I think it would make it too soupy. Good luck!! 🙂 I know what you mean…. my 4 year old has been super picky lately!! I’m just wondering if anybody has tried this with Spaghetti Squash? 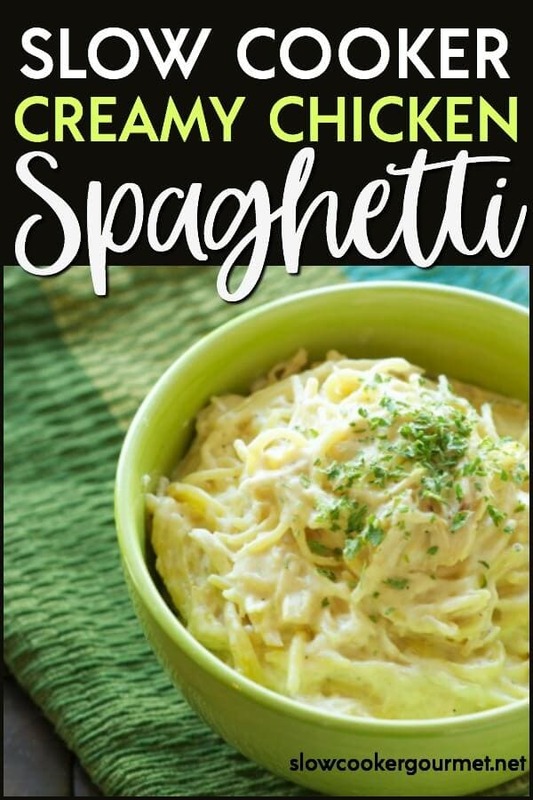 We tried it in the crock with regular noodles and it was sooo good, but I’m Insulin Resistant and the pasta made me so sluggish! Hi Kimmee! Hopefully if someone has tried it they will jump in there…but… just thinking about this and here is what I might suggest. Cut the broth back to maybe 1 1/2 cups and just use the slow cooker to make the sauce so to speak. 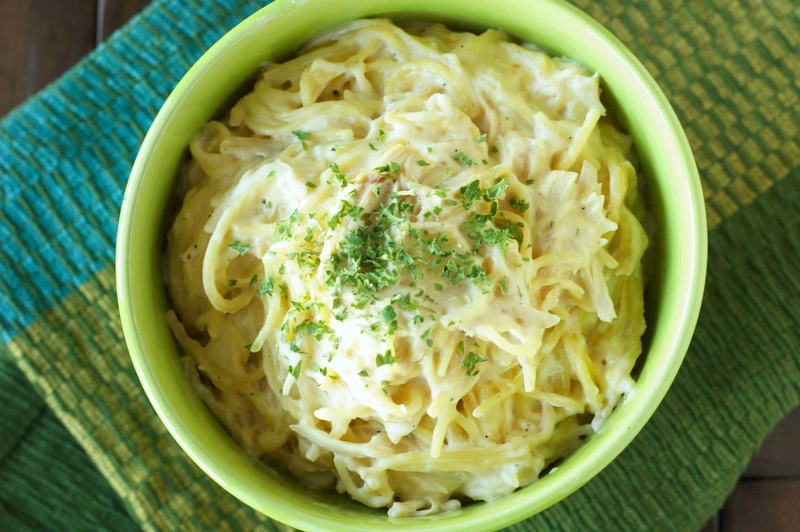 Cook the spaghetti squash separately and then just top it with the sauce? Let me know what you think!